The figure of the ham cutter is a recognizable one at both high end restaurants and family gatherings, where there’s always someone who stands out as a great cutter. While it’s a place of high honor, it also makes one a target for criticisms. How are you going to start the ham there? You’re slicing too thick… Of course there’s no way to avoid criticism altogether, but the easiest way to reduce it is to have the proper skills – and the proper tools. First amongst these is a sharp ham knife and a shorter blade for peeling and cutting around bones. But knives are of little use without a ham support which allows you to cut smoothly without worrying about whether the ham is going to stay in place. There are a great many ham holders on the market, but they’re not all created equal. It’s not always easy to decide which one is right for you, so let’s look at the factors you need to consider when seeking the perfect ham holder. It’s crucial to ensure that the base of your ham holder does not slide around when you make your cut. The first factor affecting this is weight – if the ham and holder together weight many pounds this weight alone will hold the ham holder in place. 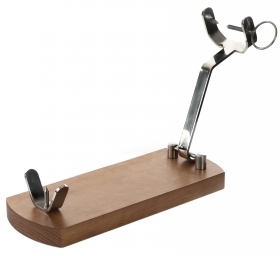 But it’s also desirable the the ham holder have rubber feet on its base to prevent slippage on wooden surfaces. Thus the base of the ham holder will be firmly anchored in place, preventing unexpected movements that could spoil your cut, or worse, cause an accident. To cut comfortably requires being able to cut at certain angles. It’s always preferable that the ham should be held so that the cutter does not have to make cuts at awkward angles, increasing the chance of a poor cut or an accident. Additionally, as cuts are made, the surface of the ham changes shape and a good ham holder can accommodate this. A quality ham holder will have a grip, allowing rotary and height adjustment. Often the screw that secures the ham to the stand will be adjustable too so that both the stand and the ham can be moved, together or independently. 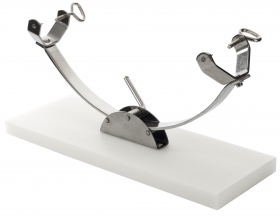 As far as the height adjustment is concerned, the part of the ham holder to which the ham actually attaches must be extensible, allowing raising and lowering of the hoof. Not all ham holders have this feature, but many experts consider it helpful. There are other fastening systems, including tourniquet pressure, using two boards and a rotating handle that clamps the ham in place. Professionals typically prefer the so-called thumbscrews set-up though. It’s true that many people choose to leave their ham holder set upend installed in the kitchen, instead of moving it around. Sometimes people will simply leave it in place with a ham in it, covered by a cloth. However, this can take up a lot of space in the kitchen, and some people ned to be able to travel with their ham holder, or only use it on special occasions. In these cases, the best option is to buy a ham holder with folding arms and a bag which you can use to transport it easily and comfortably. Obviously, not everyone has the same needs. Someone who cuts ham only rarely can get the right ham holder for a lot less than a professional or a ham lover who cuts ham every day. 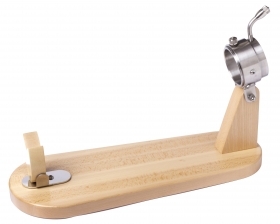 If you’re an occasional ham aficionado, you might be able to get a perfectly adequate ham holder for €30. But for cutting a lot or often, you’ll need to look at materials and construction to make sure your ham holder can last the course. Look for models that use stainless steel and solid wood, so that you avoid chipping, scratches and premature deterioration. There are also some very high quality plastic models which are very practical and look like new after cleaning! Undoubtedly, this is related to the question of stability. Simply put, a ham holder with a larger base area will tend to be more stable. You should think about it relative to the size of ham you expect to consume, though: if you plan to eat ham only occasionally, you’re more likely to buy smaller hams and shoulders and thus to be better served by a smaller ham holder. If you eat ham regularly, or if you runs bar or restaurant, though, you might need something with a long base so that you can accommodate a ham up to 12kg. You should also keep in mind that a shorter base can tend to tilt a ham more. 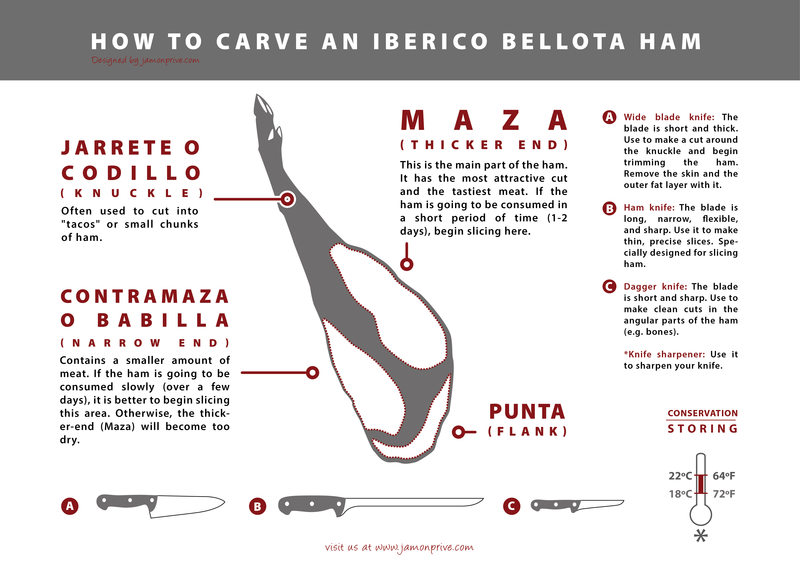 While some cutters like that, most say that the ideal position for the ham is horizontal and that the ham holder’s base should be longer to accommodate this. Most types of ham holder have at least one vertical skewer in the area of the stifle. This is the easiest sway to fix the ham in place, since its own weight helps to secure it while it’s being cut. You’ll also find models with two skewers or three vertical spikes, especially where there’s also a locking clamp for the hoof. However, despite their popularity,many cutters prefer not to use ham holders with skewers, which they say allow air in and damage the organoleptic qualities of the ham. 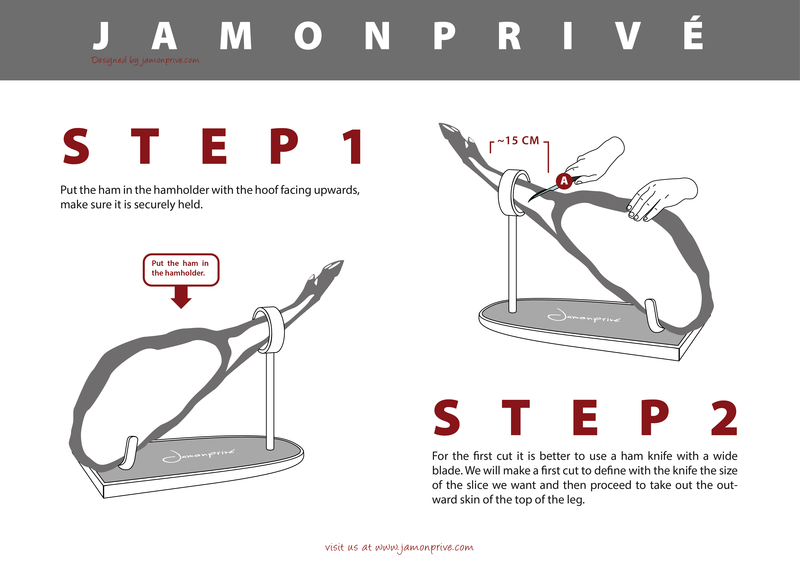 If you choose to avoid skewers, make sure that your ham holder has a high quality locking system on the hoof. Hygiene is a very important factor to consider. Your ham holder is a lifetime investment. To prevent oxidation of the metal parts, as we have said, all metal parers should be made from stainless steel. For the body of the ham holder, it seems obvious that plastic materials or Silestone, a mineral compound, would be wearier to clean than wood because they are nonporous and do not absorb any fat, which does tend to happen with wooden supports. This is a minor problem, though, and one that is little related to performance. Whichever base type you choose, it’s important to clean the ham holder thoroughly every time the ham is changed, to avoid the growth of dangerous bacteria or molds. This ham holder is made from pine wood. 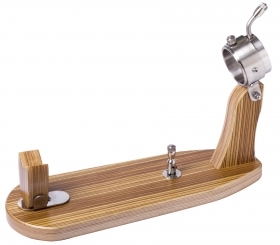 Measuring 39cm x 16cm x 1.8cm, it also features an FSC wooden holding arm. In Spanish, this product is called Jamonero Banqueta con cuchillo. This ham stand is produced in Spain with premium pine wood. The board is 39 x 16 x 2 cm and the arm is 26 x 3 cm. The iron fittings are coated with a non-toxic, antirust paint. 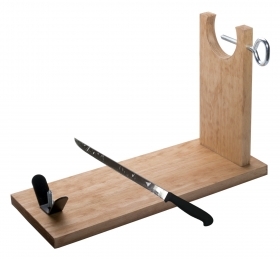 This ham stand is ideal for carving spanish hams on the bone. Extremely durable and easy to clean. 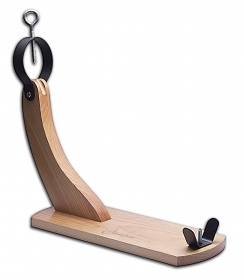 The walnut ham stand by Steelblade is a ham stand made with a pinewood base and stainless steel fittings. The fittings are hinged, making storage of the ham stand easy. Its measurements are: 40 x 16 x 30.5 cm. 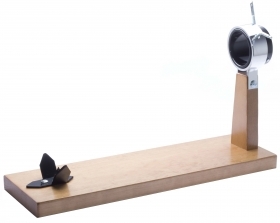 The 360 rotating ham stand by Steelblade is a ham stand made of pinewood. The ham stand measurements are: 58 x 18 x 40 cm. 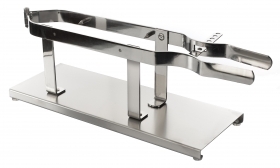 The clamped stainless steel ham stand by Steelblade is a ham stand made of stainless steel that is ideal for cutting boneless pieces. The ham stand measurements are: 47 x 17 x 18 cm. The folding ham stand with a polyethylene base by Steelblade is a ham stand with stainless steel fittings and a base made from white polyethylene. Storage is easy thanks to its hinged fittings. Its measurements are: 45 x 18.5 x 2.5 cm. 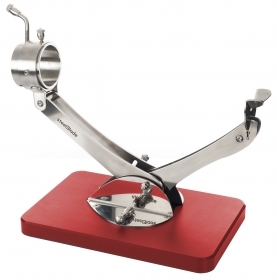 The Parma ham stand by Steelblade is a ham stand that is ideal for cutting Parma ham. The fittings are made of stainless steel and the base is made from ebony wood that also includes a suction cup for better grip. 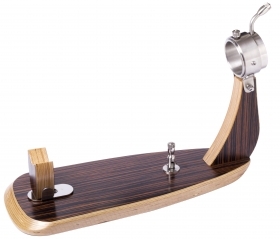 This ham holder from Steelblade is made from laminated beech wood and includes a double skewer position for either ham or shoulder pieces, as well as a 360°rotating stainless steel head. In Spanish, this product is called Jamonero Gota Haya Steelblade. 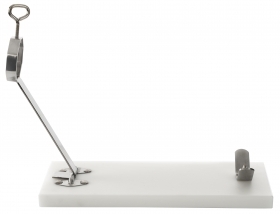 The sliding ham stand with a polyethylene base by Steelblade is a ham stand with stainless steel fittings and a base manufactured in white polyethylene. Its measurements are: 50 length x 18 width x 3 thickness. 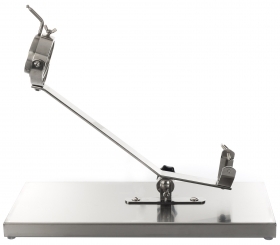 The seesaw ham stand with a rotating head by Steelblade is a ham stand made of stainless steel whose measurements are: 50 length x 18 width x 41 thickness. 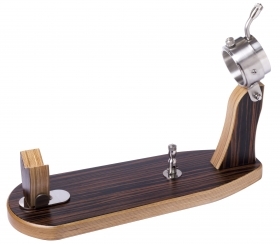 This ham holder from Steelblade is made from phenolic plywood in a zebrano wood effect, and has a double skewer position to accommodate either a shoulder or a ham. The design features suction cup technology for secure mounting and a 360° swivel stainless steel head. In Spanish, this product is called Jamonero Oval Cebrano Ventosa Steelblade. 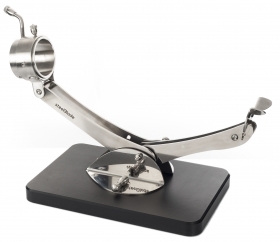 This stainless sliding ham holder from Steelblade is made from stainless steel and includes a 360° swivel and slide. In Spanish, it is called Jamonero Corredera Inoxidable cabezal giratorio Steelblade. 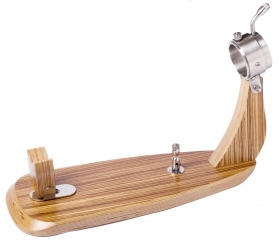 This teardrop suction cup ham holder from Steelblade is made of phenolic plywood in a Zebrano wood finish. 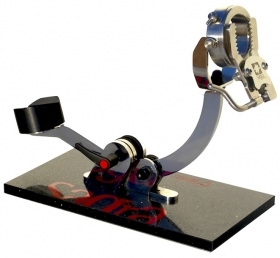 It includes a double skewer position, to accommodate shoulder or ham, and a suction cup to hold the stand in place, as well as a metallic chrome finish swivel head. In Spanish, this product is called Jamonero Gota Cebrano ventosa cromado Steelblade. 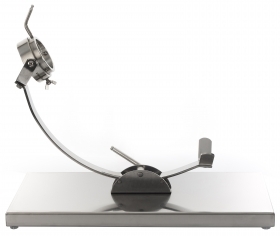 This suction cup mounted ham holder from Steelblade is made from phenolic plywood with an ebony finish and includes a dual position skewer for mounting either hams or shoulders, as well as a suction cup for secure mounting and a 360° swiveling stainless steel head. 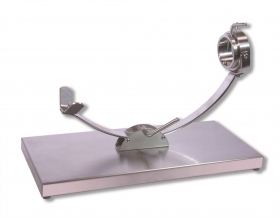 A high-end professional ham stand with a swivel to turn the ham. It comes with a tilting system and disc brakes to arrange and firmly fix the ham in the desired position. It includes a 2 cm ergonomic silestone plate in order to support the ham or shoulder in a comfortable position. A lateral displacement system allows the ham to be moved and supported on the plate. There are multiple positions for placing shoulder cuts. It provides an extraordinary grip of the ham. The 360 hinged rotating ham stand in black by Steelblade is a ham stand made with a black polyethylene base and stainless steel fittings. The ham stand measurements are: 45 x 26 x 49. The 360 hinged rotating ham stand in red by Steelblade is a ham stand made with a black polyethylene base and stainless steel fittings. The ham stand measurements are: 45 x 26 x 49. 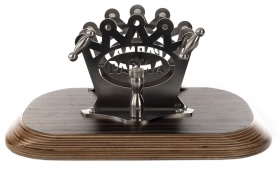 A high-end professional ham stand with a swivel to turn the ham. 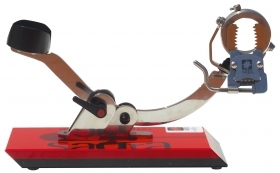 It comes with a tilting system and disc brakes to arrange and firmly fix the ham in the desired position. It includes a 4 cm ergonomic silestone plate in order to support the ham or shoulder in a comfortable position. A lateral displacement system allows the ham to be moved and supported on the plate. There are multiple positions for placing shoulder cuts. It provides an extraordinary grip of the ham.